Presbyterians at Montreat, in Appalachia, and (at the Heritage Center) in the Whole World! Our Spring Tour this year will include a wonderful mix of places and stories. Our primary focus will be on Montreat, a beautiful setting in springtime. The land was purchased in 1897 by a Congregational minister and others, as a mountain retreat for spiritual renewal. The first “Christian Assembly” was held that summer, with 400 participants living in tents. The Montreat Hotel was completed in 1901 and was replaced by the Assembly Inn in 1924. In 1905, with approval of the Synod of North Carolina, the site was purchased and paid for by selling stocks in the Mountain Retreat Association, which still owns the land. More facilities were added, and stockholders soon began to build summer cottages. In 1983 Montreat became a conference center for the reunited Presbyterian Church USA. Beginning with the artifacts, photographs, maps, books and a few manuscript collections that were not taken to either Columbia or Philadelphia, the seven part-time staff and about 20 volunteers have done wonders. Visitors to Montreat from all over the U.S. and the world have appreciated the wide range of exhibits they have mounted, and the Center has a strong educational outreach program through its website, www.phcmontreat.org. Several collections of manuscripts and photographs have been donated recently, and many people have brought in photographs to be copied for the collection. The reference library is still small, but it does include printed records, minutes, and reports of the Presbyterian Church and some rare periodicals. Thanks to their collaboration with the University of South Carolina, the complete run of The Southern Presbyterian will soon be available on microfilm. They are actively seeking donations of church histories, other reference books, maps, artifacts, and manuscripts, unless they are records that should go to Philadelphia or one of the seminaries. They hope to have their catalog available on-line sometime in 2010. Meanwhile, their many volunteers are entering short biographies of Presbyterian ministers and missionaries into a database that can be searched on-line. They are also interviewing Presbyterian missionaries and leaders, as well as those with special memories of Montreat, for their collection of audio-visual oral histories. Another project locates relevant digitized books and research materials available on-line and provides links to them from the PHC website and from its reference room. Mr. Vinson will be our speaker Friday evening, and on Saturday morning we will have our own behind-the-scenes tour, with an opportunity to see some of their more important holdings and an upcoming exhibit on the history of the English-language Bible. After lunch, members can return to use the Center’s reference materials, if they so choose. 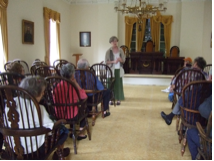 Our other area of interest on this tour will be Appalachian Presbyterians, especially in the towns of Black Mountain and Swannanoa. The first settlers in this area were Scotch-Irish and came across the Blue Ridge from Old Fort in 1784-1785. Among them was Col. Samuel Davidson, who was killed and scalped by Indians in 1784 and buried in what is now the cemetery surrounding First Presbyterian in Swannanoa. Other early settlers were Robert and Rebecca Patton, who donated the land for the cemetery and the church, which was founded in 1794. Known first as the Patton Meeting House and then as Piney Grove, it is said to be the oldest established congregation west of the Blue Ridge Mountains. Incidentally, the Patton’s daughter Elizabeth became the wife of Davy Crockett. The Presbyterian church in the town of Black Mountain was organized in 1908. It is a very active church that has had a close relationship with the Presbyterian community at Montreat. 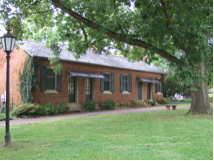 Warren Wilson College began in Swannanoa as the Asheville Farm School in 1894, founded by the home missions board of the Presbyterian Church USA to give mountain boys vocational training and classroom study. Originally a grade school, it graduated its first high school class in 1923. In 1942 it merged with the Dorland-Bell School for girls in Hot Springs and became a coeducational school and junior college. It became a senior liberal arts college in 1967. All students at Warren Wilson work 15 hours a week on one of 100 crews that are essential to the operation of the college. Work could be cleaning and maintenance of the chemistry lab and feeding the departmental cat, maintenance of computers, bicycles, or the motor pool vehicles, electrical work, carpentry, blacksmithing, locksmithing, Computer Aided Drafting, working at the college farm, forest, garden, or horse barn, running the college press, and the list goes on and on. From its agricultural beginnings, the college has always incorporated a strong environmental ethic. In the 1970s it was one of the first to offer an environmental studies major. Recently its “EcoDorm” was featured in the New York Times Magazine Section (Sept. 27, 2009) and on CNN (Feb. 11, 2010). It was designed largely by students and uses 60% less energy than a normal building of that size. Warren Wilson Presbyterian Church is located on the college campus and is also the college chapel. Organized by the missionaries who established the school, it provides a church home for many of the students and faculty. However, its diverse congregation now includes numbers from outside the college community. All in all, this promises to be one of our most interesting tours, and we hope you will join us! Scroll down for our schedule, accommodation information, map, and registration form. On February 6, after a snow delay, our society’s executive board met at the home of John and Ann Myhre in Garner. Details of the spring tour were approved, described elsewhere in the newsletter. Plans were also approved to hold our Annual Meeting this fall in Durham on Saturday, October 16, rather than the 9th. The beautiful First Presbyterian Church there has been a beacon of Christian faith in downtown Durham for almost 140 years. Over the decades the congregation has sought to serve the entire community, from tobacco workers, to Camp Butner soldiers during World War II, to their African American neighbors during the Civil Rights era, to Hispanics today. Be sure to put the date on your calendar! We also discussed improvements to our website, www.ncphsociety.org — especially the need to keep it up to date. Also, the Great Wagon Road map and Dr. Dudley’s article on the Tories will be put on the website, and we will no longer advertise these for sale. We will be adding other informative items as well from time to time. Publicity Chair Sam Martin reported that he has, on behalf of the society, begun to mark major church anniversaries with certificates presented at presbytery meetings. We hope this will increase awareness and appreciation of the long and rich history of so many of our Presbyterian congregations. Sam also said that he has presented a “Minute for Mission” about the NCPHS at his church in Biscoe. We hope that you will be moved to do the same. Many people would greatly enjoy our meetings if they only knew about them! If you have other ideas for spreading the word, contact Sam Martin, whose information is in the list of board members. If you know of a recently published church history or a completed history project that you feel is worthy of consideration for an award, please send the book or a description of the project to Awards Chairman Mrs. Ann Myhre, 1005 Park Avenue, Garner, NC 27529, by Monday, March 15. Her contact information is in the previous column. When the library and archives were closed at Montreat, almost everything was sent to either the Presbyterian Historical Society in Philadelphia or the Campbell Library at Columbia Theological Seminary in Decatur, Georgia. Both of these institutions are working to improve access to this material, and they have done a lot in a short time. Lists and descriptions are being added to their websites, but the researcher may still need to email, write, or telephone to find out what is where and whether it is available for use. By church policy, access to records less than 50 years old is restricted. 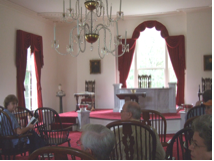 In 2006-2007, all of the General Assembly and Synod records of the Presbyterian Church in the US and some presbytery and congregational records went to the PHS in Philadelphia, along with all the manuscript collections and photographs from Montreat that related to missions or other national church boards. A search of their catalog CALVIN for records of the Synod of North Carolina brings up only microfilm of minutes, but other original records are available for use if needed. All of the congregation records from PHS-Montreat are in CALVIN. 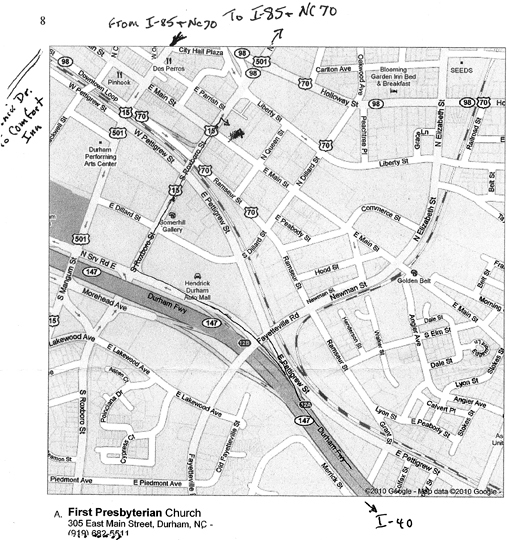 Presbytery records have not yet been described online, but the reference staff can check an in-house database to tell you which ones went where in the division. There is a separate database index to the vertical files for congregations, presbyteries, synods, and related organizations, including those for former PCUS bodies. In addition, there is a separate database for foreign mission personnel files, which currently includes 769 PCUS missionaries. The John Knox Press Collection of books and the over 3700 titles from the PHS-M pamphlet collection already appear in CALVIN. Basic information is in the catalog about many of the collections of personal papers from Montreat; however the staff at PHS are waiting for their new website to be up and running this spring before mounting the related finding aids. Currently, the finding aids are available from the reference staff. Questions about any of the collections at Philadelphia should be sent to refdesk@history.pcusa.org or by mail to 425 Lombard Street, Philadelphia, PA 19147. The telephone number is (215) 627-1852. PHS is open from 8:30 to 4:30, Monday through Friday. Most materials of more local or regional interest were sent to the Columbia Theological Seminary library in Decatur. These included the records of over 800 congregations, 80 presbyteries, and about 600 individuals. Most of these relate to the PCUS and its predecessor bodies, but they include ongoing records of the reunited church. This “Southern Stream” of the PC(USA) encompasses Alabama, Arkansas, Florida, Georgia, Kentucky, Louisiana, Maryland, Mississippi, Missouri, North Carolina, South Carolina, Tennessee, Texas, West Virginia, and Virginia. The Columbia archives website now has lists posted of the PCUS and PC(USA) presbytery and congregational records stored there. Catalog records for almost all of the congregational records have been made available through Columbia’s archives online catalog, which is separate from the library catalog. Records for about two-thirds of the collections of personal papers have also been added to the catalog, including most of the 19th century ones. Descriptions of the presbytery records, which are less frequently called for, have not yet been entered. The Associate Reformed Presbyterian records were also transferred to Columbia, but a list of those has not yet been posted. All of the unpublished local church histories, most of which were prepared by Presbyterian Women, were sent from Montreat to Columbia. Since reunion, this growing collection includes histories of about 5,800 churches from all over the country. At this time the histories (as opposed to the congregational records) cannot be searched for in the catalog, but they are available at the archives, and in some cases staff can answer questions by mail or email. If you would like to use any of the records, manuscripts, or church histories held in the CTS Archives and Special Collections area, you must telephone or email in advance to make an appointment and to be sure the materials you wish to see will be available at that time. The email is archives@ctsnet.edu, and the telephone number is 404-687-4628. They are open by appointment on Fridays from 9-4. About 30,000 books on Presbyterian history were also transferred to the Columbia library. These are being checked against their present holdings and have not yet been cataloged. When they are, they will be found through the library’s online catalog also called CALVIN but different from the one in Philadelphia! [At that time,] a number of items were housed in the little building. But as time moved on, the building began to look bad and the building was not adequately conditioned for a museum. The Gaston County Historic Preservation Commission on learning about the situation encouraged the church to restore it – with no success. Gaston Agricultural, Mechanical, Textile Restoration Association (GAMTRA) through Ray Medford, also a member of the church, secured permission from the Session of New Hope Presbyterian Church to move the building to the Heritage Park near the first county seat, Dallas, North Carolina. The contents of the building were retained by the church. The beautiful stained glass windows had to be releaded and at their new site have a protective covering of Lexan. When the building was moved, repair work, new roof, painting, handicap ramp, etc., were done at some expense to the Historic Preservation Commission and the County Parks & Recreation Commission and with the help of a number of people. Today  it sits in the county park Heritage Village at Dallas, North Carolina, along with other heritage buildings, a reminder of the Christian heritage by which our people have lived. At its new location, the New Hope Chapel has been the scene of at least two weddings, of worship services on Sundays during Cotton Ginning Days, of visitors singing Christmas carols at the Christmas celebration of our heritage. The building silently speaks. What will future generations do with that which we value today? "We would respectfully suggest to the officers of the Presbyterian Church that no one be permitted to sit in the gallery, except the choir. This, perhaps, would prevent some young men sitting in that portion of the house and spitting on those who sit below. Parties are also occasionally hit with paper wads. Bad practice, young men." On October 10, 2009, our society met at Davidson College Presbyterian Church in Davidson, NC. College Archivist Dr. Jan Blodgett told us lots of interesting stories about the history of the college and church and led our walking tour. Just outside the church is the old campus, with the original student housing from 1837 and the two literary society buildings, facing each other since 1849-1850. We then walked to the old town cemetery, where students, faculty, and townspeople have been buried over the years. Returning, we stopped at Davidson Presbyterian Church, where we were met by Pastor Darrell Van Pelt. The congregation was organized in 1894 to serve African-American Presbyterians in the rural areas around Davidson. As the town grew, so did the congregation. They are an active church and have a close relationship with the Davidson College Presbyterian Church. We returned to the Davidson College Presbyterian Church for lunch, after which Rev. Van Pelt spoke to us about his church and his own background as a Presbyterian pastor. This was followed by our Annual Meeting. Reports were made by each of the officers, and new officers were elected. John Myhre of Garner became our president. John is a hospital pharmacist, mostly retired, and the husband of our Awards Chair, Ann Myhre. Mrs. Joy Heitmann of Raleigh became our secretary. Joy in previous years has served both as our Membership Chair and also as our Awards Chair. The meeting was adjourned with prayer. Our thanks to Program Chair Tony Brewer for a delightful day! After lunch: Presbyterian Heritage Center is open 1:00 – 4:00, and Montreat Books and Gifts is open until 5 p.m. Comfort Inn, 585 Hwy 9, Black Mountain, NC 28711. Rooms for Friday night, April 9, have been set aside for us until March 19 at the special price of $74.99 + tax. Telephone 828-669-9950 and tell them this is for the NC Presbyterian Historical Society meeting. Assembly Inn, Montreat Conference Center. Rooms are $89 for a single and $100 for two people, plus tax, breakfast not included. Telephone 828-669-2911, ext. 300. They do have availability at the present time. More information on this and other lodging at the Conference Center can be found at www.montreat.org/general/housing-options. Note: If you are checking in at the Assembly Inn, or if you want to go to the Montreat book store Friday morning, you could meet up with us at the Assembly Inn at 1:00 p.m. However, we do hope to car-pool as much as possible. Let us know your plans if you can, but if you’re not at the motel by 12:45, we’ll go on to Montreat. Discounted rooms are being held at the Comfort Inn, 828-669-9950, until March 19. If you have questions, please contact our Program Chairman Tony Brewer or 919-776-8091.